Located just 20 minutes from the Inn at Vaucluse Spring, Old Town Winchester, VA is a charming and historic hub of activity. Whether you’re looking for a place to dine, immerse in local history, or shop for souvenirs, you’ll hardly find a better spot to explore what our beautiful town has to offer. Here are some of our favorite things to do in Old Town Winchester that you may want to consider for your next visit. If you’re planning a trip to the Shenandoah Valley soon, you won’t want to be without our free Vacation Guide! This downloadable booklet is filled with our best recommendations for things to do in Winchester, VA including outdoor recreation, dining, annual events, entertainment, and communities just like Old Town Winchester, VA. It’s the only thing you’ll need to plan the ultimate getaway to Northern Virginia! Many visitors often come here to indulge in the Old Town Winchester, VA restaurants. There is a plethora of delightful restaurants in this area that serve up a wide variety of tasty cuisines and dishes to satisfy all of your cravings. Just to get you started, here are some of the most popular that will get your palate tingling. Union Jack Pub and Restaurant: Restored to its original form from 1878, this authentic British pub offers tasty selections such as kidney pie and a traditional Ploughman’s lunch. Cream tea paired with scones and sandwiches and European beers are also offered. Brewbakers: This award-winning restaurant is one of Winchester’s favorite eateries! Everything on their menu, from the charbroiled burgers to the flavorful pasta dishes are crafted with consistency and quality. There is also plenty of indoor seating and an outdoor cafe along the Old Town Walking Mall. Piccadilly Public House & Restaurant: Originally constructed in 1900 as a grocery warehouse, this restaurant sports the original brick walls, refurbished floors, and an overall blast from the past. Stop by for some delicious pub fare, fresh salads, juicy burgers and wings, and more. No vacation is complete without a little retail therapy. Well, you can shop ‘til you drop at the Old Town Winchester, VA outdoor mall! Here, you will find some great souvenirs to keep for yourself and wonderful gifts to bring back to loved ones. Choose from apparel, home furnishings, jewelry, music, boutiques, antiques, artisan crafts, and bookstores. Take a look at some of our favorite Old Town Winchester shops. Bell’s Men’s & Ladies’ Fine Clothing: This is the perfect place to find a new addition to your wardrobe! You’ll be sure to find some creative and new outfits that you’ll be proud to wear. The Fret Shop: A one-stop-shop for music lovers, this is the place to go for all of your musical instrument needs. Music classes are also available! Winchester Book Gallery: This independent, locally-owned bookstore offers books, cards, local art, and even a game night every second Friday with live music. The Old Town Stained Glass Studio: This shop provides a wide variety of stained glass art, fusible glass, and supplies for any glass artist. The mosaics they offer here are truly breathtaking! No matter what time of year you visit Old Town Winchester, there are plenty of events and happenings to entertain visitors of all ages. Enjoy the great theater, which features music, comedy, and dinner during the performances. A great weekly event is the Old Town Farmers’ Market, which provides fresh, local produce for purchase. Family Movies on the Mall or Classic Movie Night are also popular Old Town Winchester events that you won’t want to miss. Concerts at the Taylor Pavilion appear occasionally on the calendar. Every second Sunday from June through September, you can enjoy a free concert, ranging from jazz to bluegrass. The art lovers will enjoy First Friday Celebration of the Arts. This monthly event includes special gallery events along with musicians playing in restaurants and cafes. Many of the shops stay open late as well, giving visitors a chance to stroll the historic streets of Old Town Winchester VA.
Stay with us at The Inn at Vaucluse Spring to experience everything Winchester and the Shenandoah Valley has to offer. When you come to our area, you deserve to stay somewhere unique. 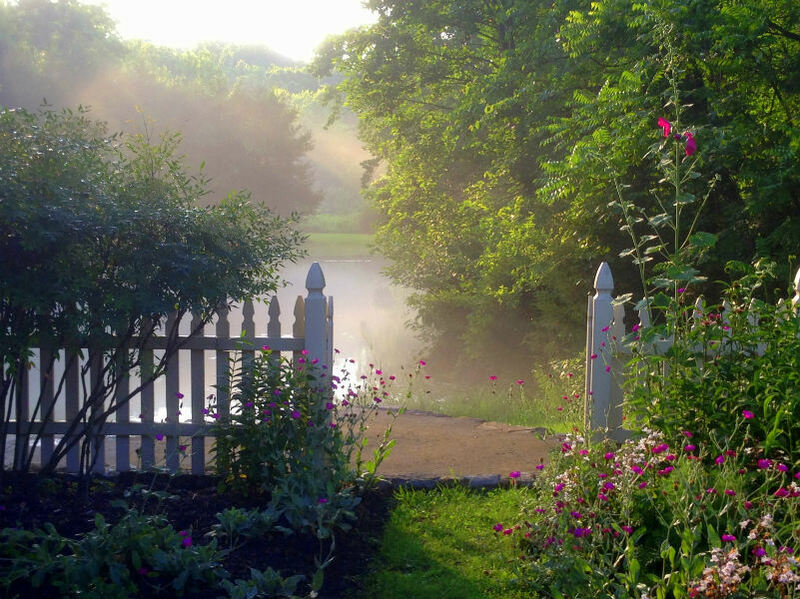 Come experience our gorgeous gardens, private crystal-clear springs, and cozy rooms and cabins. Each accommodation is different so you can choose the one best for you and your sweetheart. You’ll also be treated to a delicious breakfast each morning of your stay.